29.01.2013. Solution-provider EPLAN's new website is now online to mark the new year. The website ties in with the consistent look and feel of the Friedhelm Loh Group and includes plenty of additional content, for example, new industry pages. The idea was to allow content to be found more quickly - which involved creating new filter options and optimising the search function. Monheim, 29 January 2013. Reduced complexity - this is an area which is important not only in engineering. In times of increasing levels of information, it is important to prepare content simply and provide it in a clear, structured form. 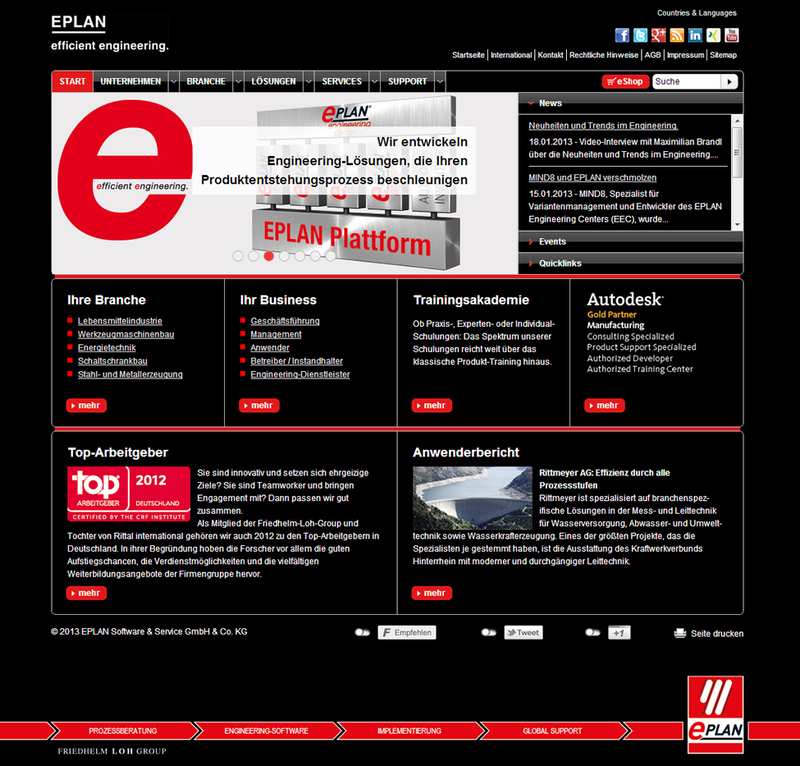 In line with this, solution-provider EPLAN completely revamped its homepage at the start of the year. The engineering provider's website ties in with the consistent look and feel of the Friedhelm Loh Group and includes plenty of additional content, for example, new industry pages. These provide different customer groups with a specific overview of the portfolio of CAx solutions and services and are being extended on an ongoing basis. "The new internet site is in the consistent corporate design of the company group," explains Haluk Menderes, Managing Director of EPLAN. "The new website makes it even easier for our customers and prospects to get to the content they want in just a few clicks. 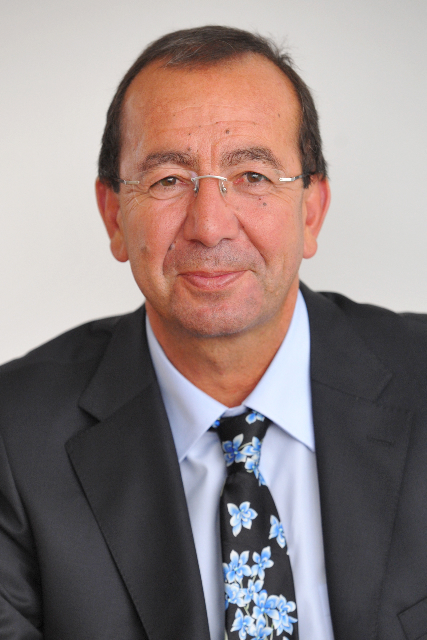 By the Hannover Messe, all our international websites will have the same design." Visitors can access the most important news via a series of different start images. New filter options in the user reports section allow visitors to find relevant content quickly - there will be reports from the field from countries all over the world here by the Hannover Messe. Direct interaction with Facebook, Twitter, Google+ and other social media platforms supports all channels of communication and offers partners or customers with the opportunity to share content. Apps can also be accessed directly via quick links. For example, the 'eplanet' app, a special online edition of the twice-yearly customer magazine, or the EPLAN Info Center, which offers a trip through the virtual world of EPLAN. This means a range of background information about the global solution-provider can be accessed from an iPad or smartphone. The videos have also been optimised. 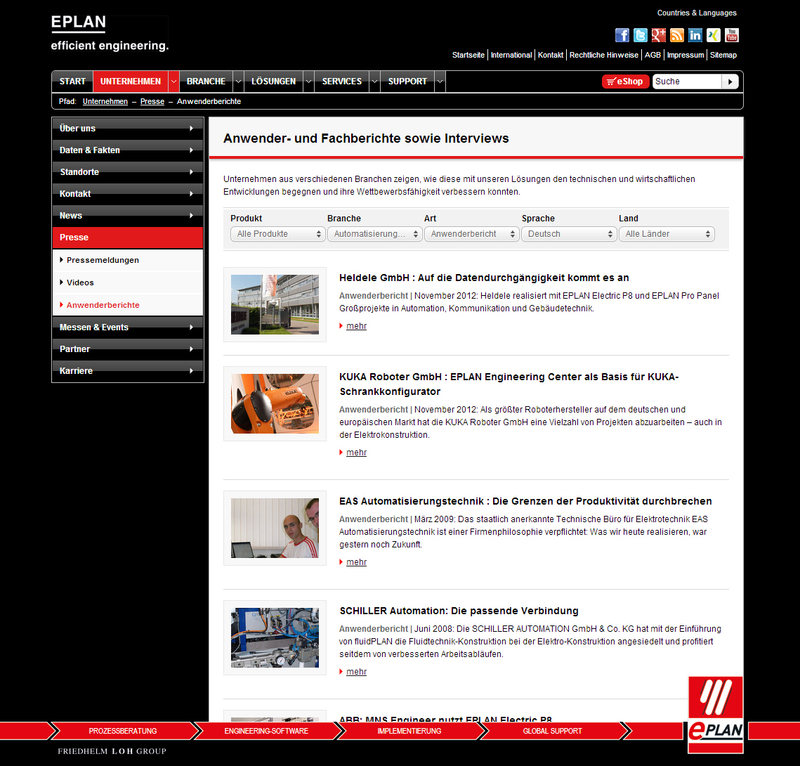 A comprehensive selection of interviews and product videos relating to the EPLAN Platform can be accessed via: www.eplan.de. Image 1: "The new website makes it even easier for our customers and potential customers to get to the content they want in just a few clicks," explains Haluk Menderes, Managing Director of Eplan Software & Service. Image 2-3: The website ties in with the consistent look and feel of the Friedhelm Loh Group and includes plenty of additional content. Reproduction free of charge. 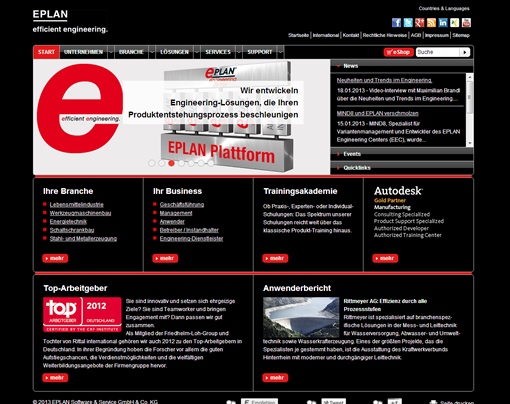 Please specify "EPLAN Software & Service GmbH & Co. KG" as source. Please send us a reference copy.